In almost every sporting activity, there is one thought that inevitably enters a competitor's mind… the quest for mastery. This level of attainment would place the individual in an elite group of competitors in that sport and they would stand as an example of the discipline and fortitude required to reach that level. In American chess, the task has a bit of intrigue because it is somehow related to a gargantuan intellectual accomplishment. Thus, the United States Chess Federation (USCF) awards the players reaching the 2200 barrier with a certificate of "National Master" as if they have completed a college degree. But what about the "Candidate Master," or the "Expert?" Throughout our early years of chess, most of us have stated our desires to become Chess Masters. Whether one's quest of mastery is realistic or not is beside the point… it is the belief that one can achieve this lofty goal that is commendable. There was once a martial arts movie called "The Last Dragon," a movie with laughable acting, but with a very interesting message. The road to mastery is within… one has to believe that they are truly a master before they can attain that goal. In listening to the various levels of Masters, there is one commonality that they seem to mention… focus. In pursuing this goal, one has to have a plan and a particular focus to become a Master. A small percentage of players in the U.S. reach the respectable level of "Expert" and get stuck for a variety of reasons. Why? Apart from many socioeconomic factors, it has to do with the law of probabilities in the USCF rating system. The threshold to reach Master gets very, very high as your rating continues to climb since you will gain fewer points by beating an ever-increasing pool of weaker players. After years of trying to attain the USCF Master's title, some players seek other avenues of mastery and one popular form of chess that has produced legends is "blitz" chess. In many of the major U.S. cities, there are loads of players who have reached the "Expert" level of chess (2000-2199 USCF). A few of these players have gained a legendary reputation with their entertaining display of blitz prowess. While these Experts are exceptionally good at blitz chess, they do not demonstrate the same level of mastery in classical time controls. What is the problem? For some… it has to do with the addiction to "fast-food" chess. There are various theories on training methods and books written on charting a course to chess mastery. Some discourage playing blitz chess while others state that a moderate use of blitz can be an integral part of opening preparation and tactical training. Of course, Internet chess has added to the menu of fast-food chess as players play hundreds of games a day (including variants such as "Wild" and "Bughouse"). Many non-master players have become addicted to these forms of chess, and never get a chance to learn from the lessons that each game would bring. Despite the wide variety of chess literature, it has become common to hear many young players show a deep disregard for studying classic chess books. Most would rather make extensive use of audio/video media and computer databases. Perhaps this is the reason that in recent decades, America has produced only one home-grown Master with championship potential… GM Hikaru Nakamura. GM Alexander Yermolinsky's excellent book, "The Road to Chess Improvement" has this to say about these "modern" methods. "Unfortunately, today's somewhat relaxed chess training regimen does not help us to hone our visualization skills. 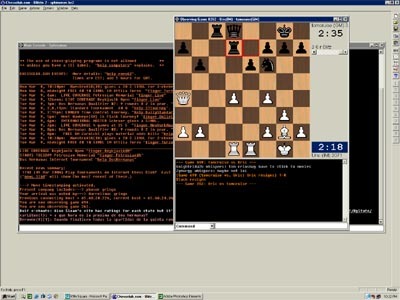 Watching games on the computer screen, enjoying chess videos and one-on-one instructional sessions, all this stuff has largely replaced good old chess-book reading." Is the Internet the domain of "Fast Food" chess? Those who know anything about American sports and its emphasis on fast-paced action and scoring will know that the real beauty is often lost in the sequence which led to the scoring. This is part of the reason for soccer's lack of acceptance among the American public. The same is true in chess which is why organizers have tried to "McDonaldize" chess to suit the American taste buds. GM Nick DeFirmian has made the same analogy in reference to American chess culture (New in Chess, 2003, No. 2). Does this present American chess with a paradoxical curse? Perhaps it breeds impatience and/or a disregard for positional subtleties often thought to be too bland for the American fast-food chess diet. Go to an American chess tournament and the book vendors will have hundreds of titles on openings (with amusing names) and ways to get a quick advantage or crushing win in less than 20 moves. In chess circles, they call this the desire to win games "for free." Most chess players raised in the U.S. are afflicted with this mindset… as I was. After a few crushing wins, these books will only get one as far as 2199 USCF. For some, that is where the development stops. Many of the legendary blitz Experts do not fare well when playing against stronger competition in classical time controls. Attacks disappear into thin air and opponents have time to see through a maze of tactics, sacrifices and three-move mate threats. 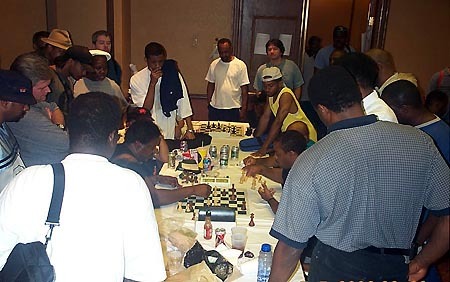 Expert Vester Wilson taking time odds from FM William "The Exterminator" Morrison in a gladiator chess battle (2003 World Open). Morrison is one of the few U.S. players to reach a high level primarily on the strength of his phenomenal blitz prowess. It also helped that Morrison had a strong "Black Bear" Club tradition which included players like GM Maurice Ashley and tactical wizard, FM Ronald Simpson. One can conduct an informal study on this phenomenon at various major American tournaments… particularly the World Open tournament. Every summer, very strong blitz players meet in the "skittles" room to exchange trash-talk, combinations and… dollars. These matches attract hundreds of spectators and there are always the "oooohs" and "aaaaahs" when a mating combination is executed during a frantic time-scramble. Strategic battles do not draw crowds… only the gladiator 3-minute battles where blood is spilled. Who are these players lurking about to catch unsuspecting prey? One would not know how strong these players are, but upon close examination, many of these dangerous "blitz demons" are Experts… particularly of African descent. I then raise the final questions: why has there been a dearth of exceptional talent coming out of the U.S.? Why is there so much emphasis on the opening play and tactics? Finally, why have there only been a few Black Masters produced in the past decade of U.S. chess? There are an abundance of Black Experts, but not a lot of Black Masters. In my humble opinion, the answer to these questions is… our chess diets contain too much fast food.